Many people choose Invisalign trays over braces because they’re so clear, they’re hardly noticeable. However, improper cleaning technique can quickly lead to discoloration, odor and bacteria buildup, which is detrimental to your health and could prolong your treatment. 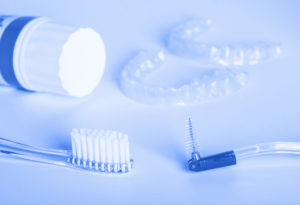 Follow these tips to keep your Invisalign trays looking like new. When you’re not wearing your trays, ensure they are safely tucked away in their case. Leaving them out in the open will not only make it more likely that you will misplace or lose them, but it will also lead to more bacteria buildup. Trays need to be cleaned each morning for the same reason you brush your teeth. As you sleep, bacteria and plaque buildup on the surface of your tongue and teeth. Wearing trays does not prevent this, as bacteria also builds up in your trays. Start and end the day on the right foot by cleaning your trays and brushing your teeth. Rinse your trays each time you remove them to prevent buildup of dry saliva and plaque. You want to avoid creating an environment for bacteria to grow. Washing your trays with unscented, uncolored anti-bacterial soap and a soft-bristle toothbrush can also help remove some of the plaque. Make sure you keep this habit up even when you aren’t at home. This is the cardinal rule for keeping your Invisalign trays clean. Water is the only thing you can drink with your trays still in place. The trays are not made of material strong enough to withstand regular chewing. Eating with trays in also makes it easier for food to get stuck between your teeth and stain the trays. Don’t forget that when you take your trays out to eat, you need to place them safely in their case. Using toothpaste and colored or scented soaps on your trays will damage and discolor them. Toothpaste creates a dull sheen on trays, which not only makes them more noticeable in your mouth, but also creates abrasions that encourage bacteria buildup. Colored and scented soaps will also stain your trays and may leave behind an unpleasant taste when you place the trays back in your mouth. The best way to ensure your trays stay clean and clear is to establish a cleaning routine. Humans are creatures of habit and are more prone to do things they are familiar with. During your treatment period, adopt a cleaning regime that meshes with your existing morning and evening routines to help it stick. Each set of trays is worn for a relatively short amount of time – usually a few weeks – but in that time, improper care can cause a lot of damage to your teeth and prolong your treatment. Follow your orthodontist or dentist’s instructions and you’ll be done with treatment before you know it. Are You Ready to Transform Your Smile with Invisalign? When you’re ready to get the smile you’ve always dreamed of, trust Family Dental Associates in Warner Robins, GA. Since 1954, our dental practice has delivered comfortable, patient-centered dental treatments to help people attain and maintain healthy, beautiful smiles. As a certified Invisalign provider, we have the expertise to help you find the right treatment plan to achieve the results you desire. Book your consultation today by visiting us online or calling (478) 971-7701. After undergoing your teeth whitening treatment, you may be feeling more confident in your smile than you have in years – so much so, that you’re ready to take on anything. However, if you want those bright and shiny results to last, there are many foods and drinks you should avoid for 24 to 48 hours after the treatment, as your teeth are more susceptible to being stained during this period. 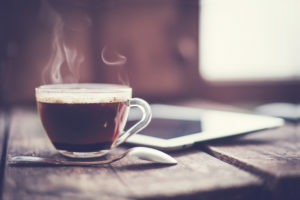 You may have assumed coffee and tea were no-nos when it comes to beverages, and that’s true. The list also includes virtually any “dark” beverage, such as dark sodas, red wine and most fruit juices. If you’re curious whether a beverage is safe to drink, ask yourself if it would stain a white shirt. If the answer is yes, it’s best to avoid. Not only are alcoholic drinks often dark in color, but the acid in alcohol can also weaken the enamel, which is especially vulnerable after whitening. Even white wine should be avoided. This goes for chewing tobacco and smoking cigarettes as well, which are some of the biggest teeth staining culprits around. Many dark foods can stain recently whitened chompers, like blueberries, beets, pomegranates and dark meats. Tomato and any other dark sauces, condiments, soups, stews and marinades should also be avoided. Even chocolate and artificially-dyed candy can cause stains after whitening. Overly sensitive teeth are a common but temporary side effect after the whitening procedure. To avoid high levels of discomfort, it’s recommended you also avoid overly cold or hot food and beverages during your recovery. That means iced drinks, scalding soups and frozen desserts are off limits. You may be able to use a desensitizing product afterward to help combat excessive discomfort. If you’re not a vegetable eater, you now have a great excuse to kick them to the curb, at least temporarily. Leafy greens, carrots, sweet corn, green beans, peas, broccoli and even mushrooms have the potential to stain teeth post-whitening. So, What Can You Eat After Teeth Whitening? If you’re ready to transform a dim smile into a beaming beauty, consider what the Zoom! Whitening at Family Dental Associates can do for you. Our caring and knowledgeable staff are committed to providing our patients with the smile of their dreams. For more information about whether Zoom! Whitening is right for you, call (478) 971-7701 or visit us online today. Your teeth perform several vital functions. Not only do they allow you to eat your favorite foods, but they also help you speak and give you the confidence to smile wide. Unfortunately, people who are missing one or multiple teeth can’t always experience the same benefits that a healthy, beautiful smile provides. While many assume traditional dentures or bridges are the only option for replacing missing teeth, that’s not the case. Modern dental implants can provide permanent, subtle replacements for any number of missing teeth, and they’re much more versatile than you might think. Dental implants are artificial tooth roots that are surgically implanted into the jaw bone underneath the gums. Often called a post or frame, the artificial root can be made from different materials, such as zirconia or titanium, and replace one or multiple teeth, depending on the needs of the patient. The surrounding bone heals around the implant to provide a sturdy, reliable and permanent base for one or more replacement teeth, a bridge or even dentures. After the post has been installed, an abutment is attached. Abutments can be fitted for the addition of a single crown, or synthetic tooth, a bridge or dentures. Crowns are generally permanent, and are designed to match the size and general appearance of neighboring teeth. If someone is missing all their teeth, several implants can be strategically placed on the jaw and an entire row of synthetic teeth can be attached to the abutments on a bridge or as dentures. What Makes Dental Implants Versatile? Dental implants are considered versatile because they can be used to replace one or all of a person’s teeth, or be used to stabilize dentures. Because traditional dentures are not fixed in place, they often slip or feel unstable,which can be an uncomfortable embarrassment for the wearer. Dental implants working in conjunction with dentures or on their own provide a stable, natural-looking, permanent replacement for as many teeth as needed. Another benefit of dental implants is that no other teeth need to be prepared or altered. Some other tooth replacement treatments, like traditional bridges for example, require neighboring teeth to be ground down or prepared in some fashion. Dental implants do not affect or rely on neighboring teeth in any way and in most circumstances, last a lifetime. Patients have the post implanted into the jawbone. It has the appearance of a small screw and is usually made from titanium. This is the most common type of dental implant. If the patient’s jawbone cannot support the post, they can opt for a subperiosteal implant. Instead of just a post, a metal frame is placed under the gum and fixed on top of the jawbone. The post(s) are then attached to the frame and the tooth can be put in place. After a typical dental implant procedure, a person must wait until the jawbone has healed completely and fused with the post before having a synthetic tooth attached. During an immediate load procedure, on the other hand, a temporary tooth is placed on the post the same day. This type of dental implant is often used to stabilize dentures. They are smaller than traditional posts – about the size of a toothpick – so the procedure is less invasive. Patients who need an entire row of teeth replaced may consider All-On-4. As its name suggests, four posts are implanted in the jawbone and a full row of natural-looking teeth is attached to the posts. In cases where the jawbone isn’t dense enough to support a dental implant, several treatments can be used to improve the jawbone’s structure. These treatments include bone augmentation, a sinus lift, ridge expansion and implant site development. Your dentist will be able to recommend one of these treatments if necessary. Who’s a Good Candidate for Dental Implants? The best dental implant candidates have healthy gums, sufficient jawbone density and are non-smokers. 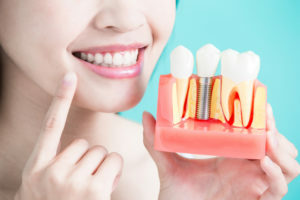 A dentist might not recommend dental implants for people who suffer from illnesses like diabetes or leukemia because these conditions slow the healing process considerably, which could prevent the post from remaining firmly in place. Have More Questions About Dental Implants? Dental implants are a popular procedure for many reasons. Their versatility as a tooth replacement option is one of the main reasons patients opt for dental implants over traditional bridges or dentures. If you have more questions about how dental implants can change your life, Family Dental Associates can help get the process started for you today! For more information about our single tooth or All-On-4 procedures, call (478) 971-7701 or visit us online. 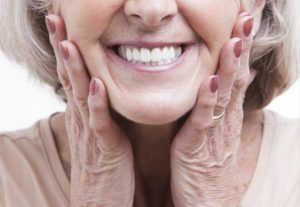 Full or Partial Dentures: Which Is Right for You? As you can see, tooth loss is common among all age groups, especially as age increases. If you are experiencing tooth loss, a full or partial denture may improve the aesthetics of your smile and the function of your teeth, mouth and jaw. Full dentures act as a replacement for a full set of teeth. They can replace the top or bottom row of teeth or all the teeth in your mouth. In order for them to work, any remaining healthy teeth must be pulled so the dentures can fit on top of the gums. Because of this, full dentures are recommended for people who are missing most or all of their teeth. Full dentures can be made from a variety of materials, including acrylic resin, nylon polymer and metal, and occasionally porcelain for more realistic-looking prosthetic teeth. The top set will cover the entire roof of your mouth, but the bottom set will allow the tongue to move freely for easy speech and eating. Your prosthodontist will take special care to make the teeth look as realistic as possible, and the base is pink-colored to match your natural gums so your dentures remain inconspicuous. There are two types of full dentures that you may choose from, and each serves a vastly different purpose. These dentures typically last from five to eight years and are created with the intention of long-term use. Before the dentures can be worn, any remaining teeth must be pulled and the gums given time to heal. The healing process can take several months. After healing is complete, your prosthodontist will take molds of your mouth and begin crafting a full denture, taking appearance, fit and function into account. As their name suggests, immediate dentures can be put in the mouth immediately after your remaining teeth have been removed. 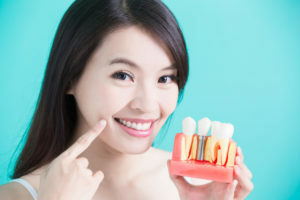 Many people take advantage of this option because they do not want to go without teeth during the healing process, whether for aesthetic or functional reasons. However, these dentures cannot be used long-term and may need to be adjusted. As your gums heal, they shrink and change shape, meaning immediate dentures that fit well now will be the wrong size for your mouth over the course of the next several weeks or months. Partial dentures are used in instances where a patient is missing a section of teeth but still has healthy teeth around the gap. While some may view partial dentures as a purely cosmetic alteration, these dentures also distribute jaw pressure to prevent the premature loss of additional teeth, stop teeth from shifting and reduce the chance of gum disease due to improper cleaning. There is great variety in the types of partial dentures you can choose. Some stay put with metal clasps that hook around your healthy teeth; however, these can sometimes show. Other partial dentures are mounted more securely with precision attachments that allow the denture to snap into place. This method also has a downside, as many prosthodontists recommend putting a crown on otherwise healthy teeth so the precision attachments are sturdier. The type of partial denture you choose will likely depend on what you can afford, how natural you want your dentures to look and which fit is most comfortable for you. When people use the term “fixed partial dentures,” they are actually referring to a fixed bridge or a dental implant bridge. A fixed bridge is a connected set of prosthetic teeth that slips over two filed down abutment teeth on either side of the tooth gap. These abutment teeth support the bridge, which rests on the gums. With a dental implant bridge, the prosthetic teeth slip over two implants instead of two natural teeth. These implants are surgically inserted in the jawbone to keep the bridge anchored more firmly. When most people talk about “partial dentures,” they are referring to removable dentures that can be taken out by the patient for regular cleaning after meals and at night. You don’t need any special tools to remove these dentures; simply slip them out using your fingers. There are a few options available to suit people at every price point. Also called acrylic removable partial dentures, dental flippers function much like a regular retainer with sets of prosthetic teeth and gums attached. Typically, the teeth are connected to a metal framework that can be popped in and out of your mouth with ease, and like conventional dentures, flippers can have metal clasps that hook around nearby teeth. They are by far the most affordable partial denture option out there, generally costing only 300 to 500 dollars.3 While most people use dental flippers temporarily while waiting for their mouth to heal after an injury or surgery, especially in the case of a missing front tooth, some prefer to use them forever because of their lightweight feel and low cost. However, flippers can be thinner and more fragile than other partial dentures. Unlike other versions, flexible partial dentures don’t contain any metal. Instead, they are made of a thin thermoplastic nylon resin, as opposed to more rigid acrylic. Some patients feel they blend in more seamlessly with natural teeth for an unaltered-looking smile. A cast-metal partial denture is a more permanent solution and can replace more teeth than a flipper. These dentures tend to have a larger metallic base as well. They will typically take longer to make than a flipper so they fit more comfortably in your mouth. If you feel you would be a good candidate for full or partial dentures, the highly qualified dental professionals at Family Dental Associates can help! Our team has been serving Warner Robins, Georgia for more than 60 years. We prioritize patient comfort during every visit, so you can be sure we’ll find a dental solution that’s right for you. All our patients also have access to an in-house Dental Savings Plan starting at just $299. Under this plan, you get two standard exams and cleanings per year completely free as well as discounts on many other dental services, including cosmetic procedures like dentures. Check our Dental Savings Plan page for more details. To schedule your first appointment, call us at (478) 971-7701 today! It’s said your smile is the first thing people notice about you. Given its importance to self-esteem and overall perception, it’s no surprise more than four million people in the U.S. are improving their smile by wearing braces, with about 25 percent of those people being adults.1 When people make the decision to receive orthodontic care, they are often faced with the choice of traditional braces or Invisalign. Which option is best for you depends on a variety of factors, but oftentimes Invisalign is a great fit for adults and teenagers who want to discreetly improve their smile and enjoy better oral hygiene in a quick and comfortable manner. 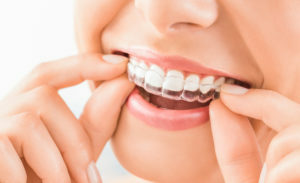 Invisalign is a revolutionary orthodontic treatment that discreetly straightens teeth and corrects off-centered bites using nearly invisible and removable plastic trays, called aligners. Aligners are customized just for you using 3D computer imaging technology so they seamlessly fit over your teeth, making them much more comfortable than traditional braces. Patients who choose Invisalign should wear their aligners for about 20 to 22 hours each day to ensure optimal results. Though old-fashioned braces and Invisalign accomplish the same goals with tremendous success rates, there are a handful of distinct advantages Invisalign has over traditional braces. Traditional braces use abrasive metal and wires, which easily cause cuts and painful sores to develop on the gums, tongue and inside of the mouth. People with traditional braces rely on wax and cotton balls to avoid these side effects, which add to the discomfort. Invisalign aligners are made from a smooth plastic that’s made just for your mouth, making oral discomfort rare for many. With Invisalign, you change to a different sized aligner every two weeks, so progress occurs at a much faster rate. This means aligners only need to be worn for as little as six months in some cases. Traditional braces are often worn for two years or more. Many people choose Invisalign over traditional metal braces because they’re virtually invisible, which helps alleviate common anxieties people have about braces. Adults especially prefer wearing Invisalign so they can confidently live their lives without having to worry about embarrassing food caught in their braces or how their braces may affect the way they talk. In addition to being more comfortable, your aligners can easily be removed for activities like eating, drinking, flossing and brushing. Conversely, metal braces can make eating certain foods or maintaining proper oral hygiene more difficult, potentially leading to additional health problems or costly damage to the braces. Once your aligners are crafted, your entire treatment plan is mapped out for you, leaving no surprises in terms of how long your treatment will take and what your progress will look like. You’ll also cut back on visits to your orthodontist. When you do have to visit the orthodontist for new aligners, the visit is usually lasts as long as it takes for you to pick up your new set of aligners and walk out the door. On average, Invisalign users have follow-ups with their orthodontist every six weeks or so. Unless you’re experiencing a complex issue requiring more than traditional alignment, Invisalign may be the ideal solution for you or a family member. Adults and teens looking to correct everything from overcrowding and wide gaps to overbites and crossbites are great candidates for Invisalign. Even adults who wore traditional braces as a child can reap the benefits of Invisalign years later if their teeth have shifted or they’re not happy with the appearance of their smile. If you have more questions about the advantages of Invisalign and how it could change your life, reach out to the knowledgeable staff at Family Dental Associates and schedule an appointment. Call (478) 971-7701 or visit us online today!